CD16 phycoerythrin (PE)-conjugated clone 3G8 (# A07766, isotype: mouse IgG1). All antibodies and their respective isotype controls are from Beckman Coulter, Krefeld, Germany. Absolute counting beads: CountBright absolute counting beads® (# C36950, Invitrogen, Karlsruhe, Germany). Blood is collected in K3E S-Monovettes® (# 05.1167 Sarstedt, Germany) and 100 µl of the whole blood is admixed with 5µl of each antigen specific fluorochrome–labelled antibody (dilution 1:20). The samples are then incubated for 20 min at 4°C in the dark. Lysis of erythrocytes is performed using a Coulter Q-Prep® lysis instrument, which adds a volume of 1000 µl, and the sample is supplemented with 100µl of CountBright absolute counting beads for determination of absolute numbers of cells. To ensure maximum viability, stained cells are analyzed promptly. All signals are acquired on a FACSCalibur flow cytometer (BD Biosciences, San Jose, CA). The instrument amplifier setting was calibrated monthly using Calibrite™3 beads and Calibrite™APC beads (# 340486 and # 340487, BD Biosciences). CellQuest software (version 3.2, 1998) is used to acquire data. First, the CD45-positive leucocytes are visualized in a histogram showing all fluorescence 4 (APC-positive) events. An acquisition threshold is set such that any unwanted events like CD45-negative platelets, dead cells and debris are not recorded. 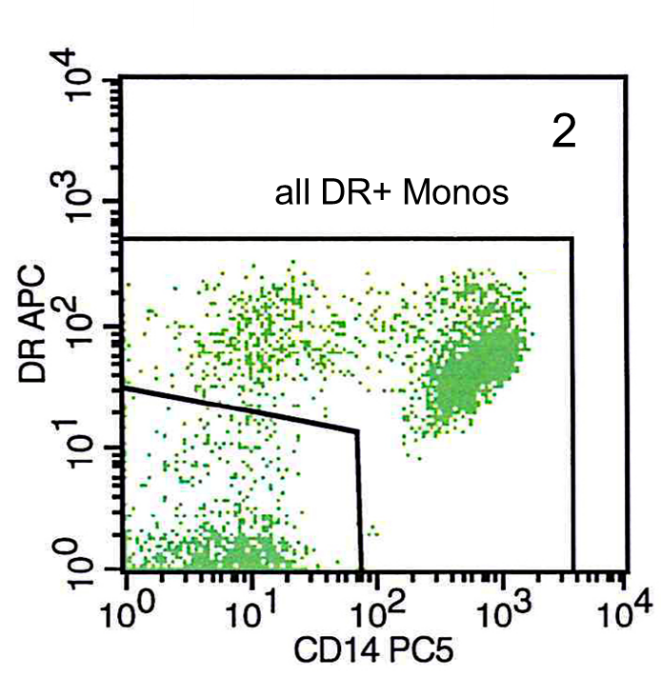 The monocytes are then defined by sequential gating on all CD45-positive leukocytes in light scatter plots, CD14 versus HLA-DR-staining and CD14 versus CD16 staining. Using isotype controls, voltage and compensation the instrument is set such that the cells are adequately positioned in the dot plots. For direct determination of absolute numbers of cells, we use CountBright® absolute counting beads (Invitrogen, Karlsruhe, Germany). 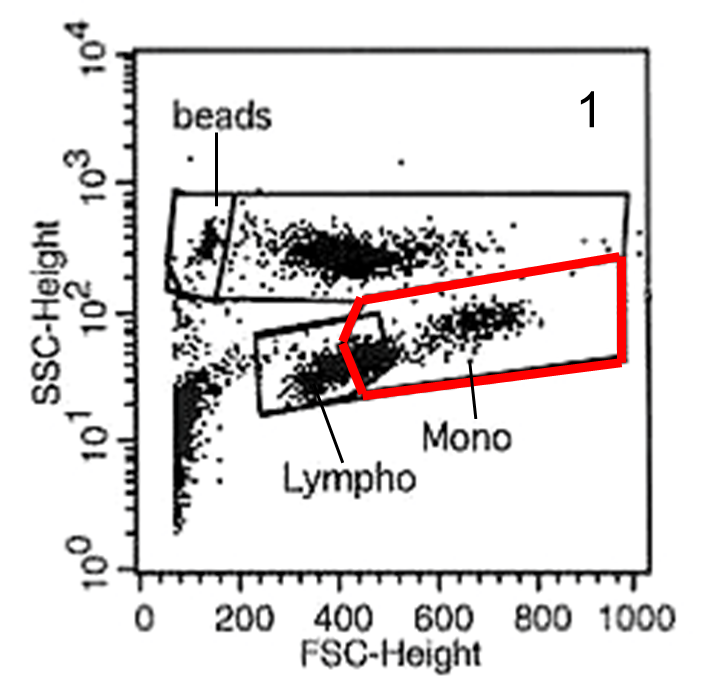 These beads are visualized in the CD45 plot above as a narrow peak at the upper end of the scale. 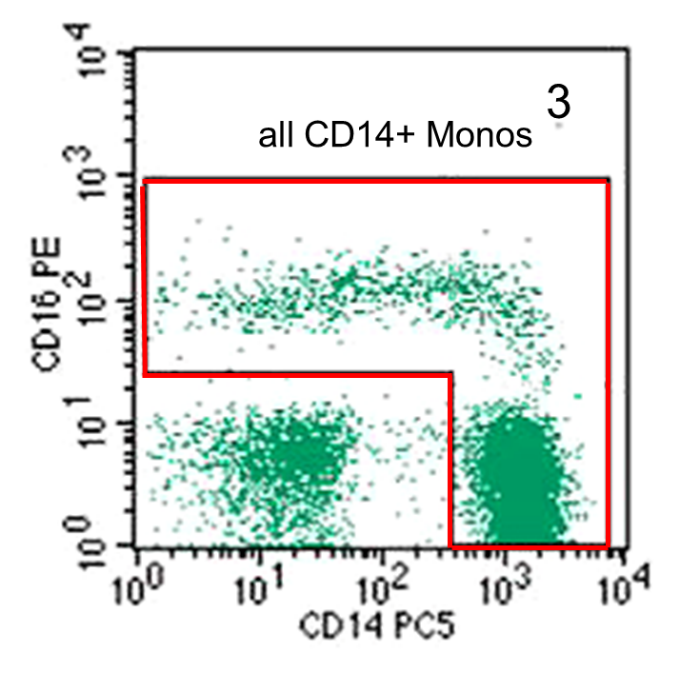 Using an isotype control for CD16 the can be used to clearly dissect the CD14++CD16+ monocytes from the CD14++CD16- classical monocytes (see example below). 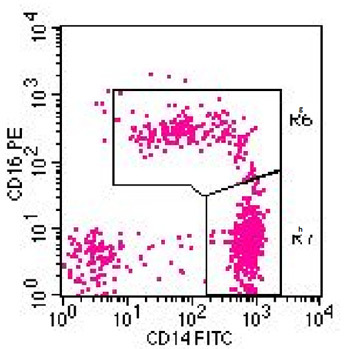 These CD14+CD16++ intermediate monocytes in healthy individuals form a very minor population of cells, but they can become a major population in inflammatory diseases like asthma and sarcoidosis. SLAN-FITC IgM, # 130-093-027 Miltenyi-Biotec; Isotype-FITC IgM, #130-093-178 Miltenyi-Biotec; CD16-PE IgG1 clone 3G8, # A07766, Beckman Coulter; , CD14-PC5 IgG2b clone My4, # A07765 Beckman Coulter, HLA-DR-APC IgG1, # IM3635, Beckman Coulter; all antibodies are use at 1:20 final dilution. Counting beads (C36950; Molecular Probes). Blood is collected in K3E S-Monovettes® (# 05.1167 Sarstedt, Germany) and within 4 hs 100 µl of the whole blood is admixed with 5µl of each antigen specific fluorochrome–labelled antibody (dilution 1:20). The samples are then incubated for 20 min at 4°C in the dark. Lysis of erythrocytes is performed using a Coulter Q-Prep® lysis instrument, which adds a volume of 1000 µl, and the sample is supplemented with 100µl of Molecular Probes absolute counting beads for determination of absolute numbers of cells. To ensure maximum viability, stained cells are analyzed promptly. 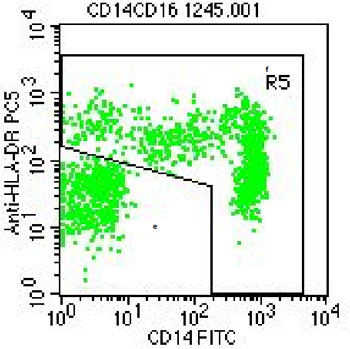 The cells from the monocyte scatter gate are then shown in the CD14versus HLA-DR plot. Here a gate is put around all CD14+DR+ events giving all DR+ cells, which still includes DR+CD14- cells, like B cells and activated T cells (Figure 2). 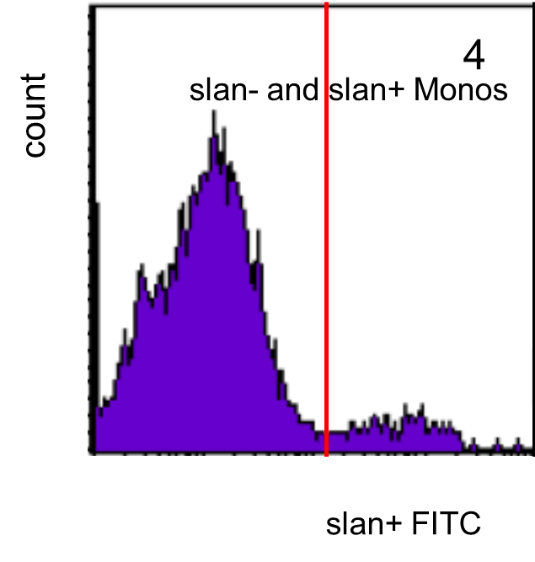 For these cells the slan staining is shown in a single color histogram and here the slan+ cells are defined by a cut-off line as shown in Figure 4. 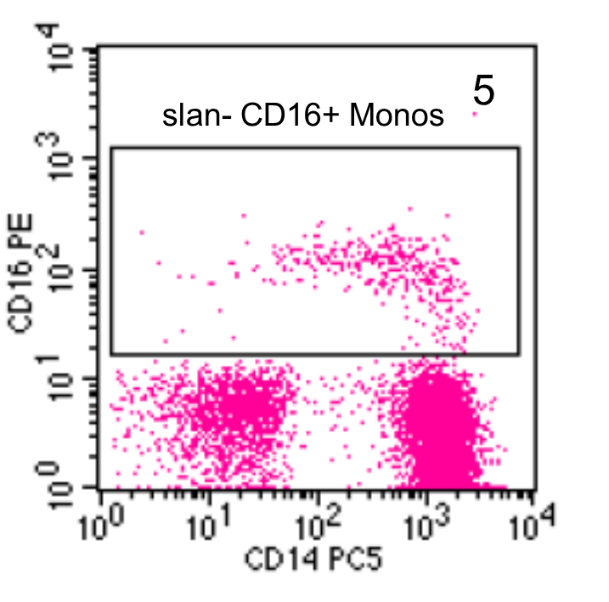 The slan-negative cells are then shown in a CD14 versus CD16 dot plot and a gate is set around the CD16+ cells (Figure 5). These are the slan-negative CD16+ intermediate monocytes. 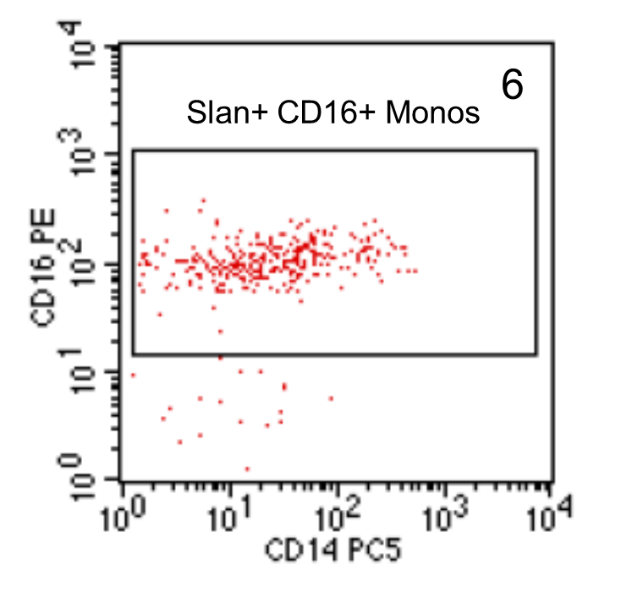 Then the slan-positive cells are shown in a CD14 versus CD16 dot plot and a gate is set around the CD16+ cells (Figure 6). These are the slan+ CD16+ non-classical monocytes. An isotype control for CD16 can be used to clearly dissect the CD16+ monocytes from the CD14++CD16- classical monocytes and for the slan marker an IgM-isotype control can be used to help setting the cut-off.